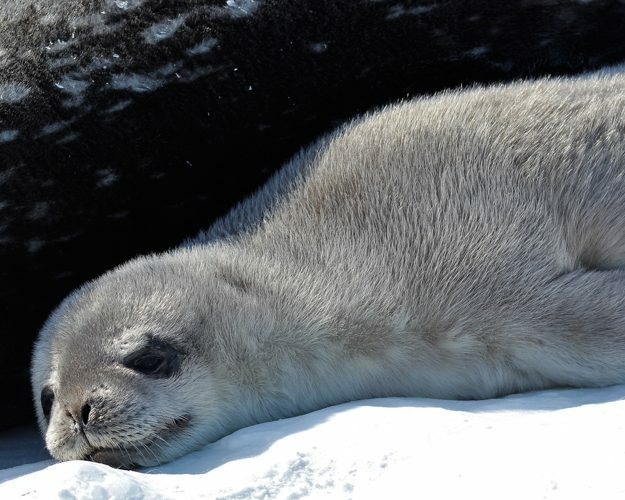 Cal Poly scientists gather data on Weddell seal pup in Antarctica. 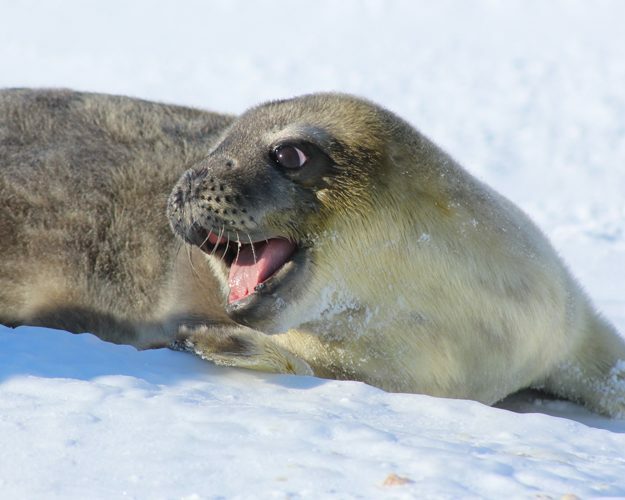 In fall 2017, a team of Cal Poly students and faculty braved the harsh conditions of Antarctica for a 10-week research expedition to study Weddell seal pups in the wild. 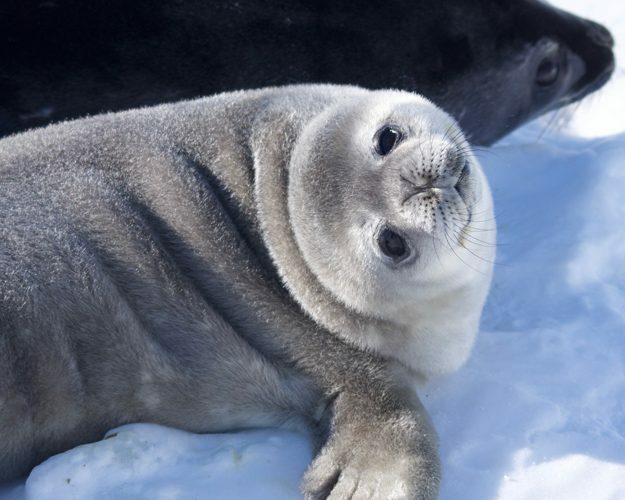 The goal: investigate how the seal pups quickly adapt to the polar environment and regulate their body temperature on the ice and in the frigid waters. Cal Poly’s team included Dr. Heather Liwanag, assistant professor in the Biological Sciences Department, Dr. Linnea Pearson, a post-doctoral fellow at Cal Poly, Dr. Lars Tomanek, a professor in the Biological Sciences Department, Emma Weitzner, biological sciences graduate student, and Melissa Voisinet, biological sciences graduate student. 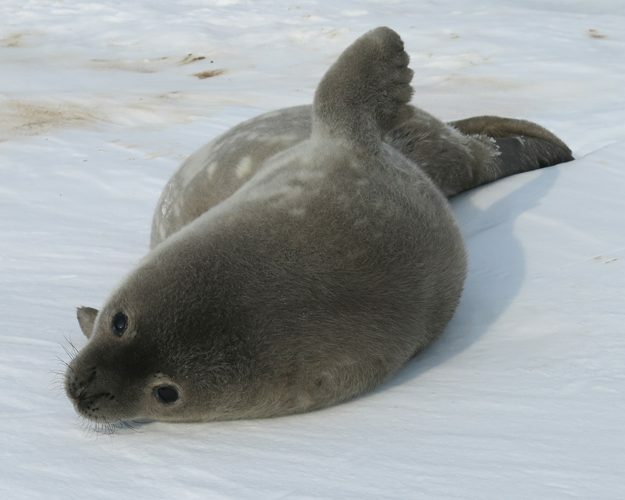 Weddell seals give birth to one pup in October or November — spring in the southern hemisphere. The scientists based the expedition close to a breeding colony to survey eight pups as they learned to swim and hunt, staying close to their mothers until they weaned. The team’s primary objective was to collect reliable data from the seals. After safely separating pups from their mothers, the team regularly gathered blood samples, tissue biopsies, and weight and length data as the pups grew. In other procedures, pups were put into a metabolic chamber that measured the seals’ oxygen consumption. Combined, the information gathered will help determine the pups’ metabolic rates over time and illuminate how they adjust to the conditions so quickly. Along the way, the team has had to adapt to the extreme cold, poor visibility and wind by improvising many tools and procedures. The vast terrain of ice often cracked and altered transport routes. The seals themselves grew from 60 lbs. at birth to more than 300 lbs. during the expedition. Between electronics seizing from the cold or samples freezing instantly after collection, students and faculty persevered to bring their findings back to San Luis Obispo to share with the academic community. The expedition was sponsored by a $1 million grant from the National Science Foundation. The team has been chronicling their events via a blog at https://icyseals.com. Dr. Liwanag here! 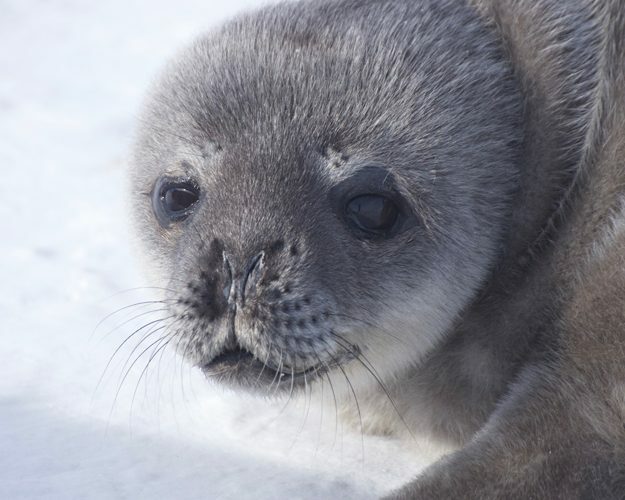 It is time to introduce you to the real stars of this project — the seal pups! Like most animals, seal pups have different personalities, and we start to see these more and more clearly when we visit them week after week. We decided to name our pups after different types of penguins. Adelie is a feisty little pup, and she and her mom like to hang out at the far end of Big Razorback Island, among the beautiful ice formations created by the pressure of the sea ice pushing against the island. 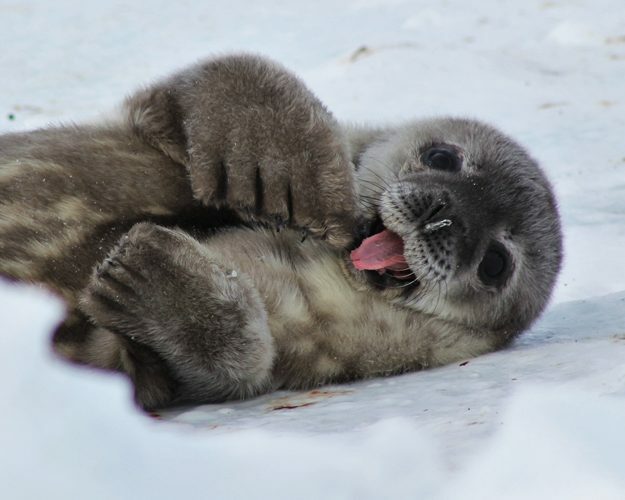 Though Adelie still has most of her baby fur, she has developed an impressive set of teeth, which Weddell seals use not only to eat but also to keep their breathing holes open. Chinstrap has one of the strongest personalities. He likes to chew on his flippers, or just about anything else he can get near his mouth. His mom has been on a lot of foraging trips without him, and he seems reluctant to join her in the water; but he’ll have to start learning to swim soon! Emperor is our heavyweight champion. He was our biggest pup at one week old, and he has continued to outweigh our other seal pups. (Emperor penguins are the largest and deepest diving penguins in the world.) 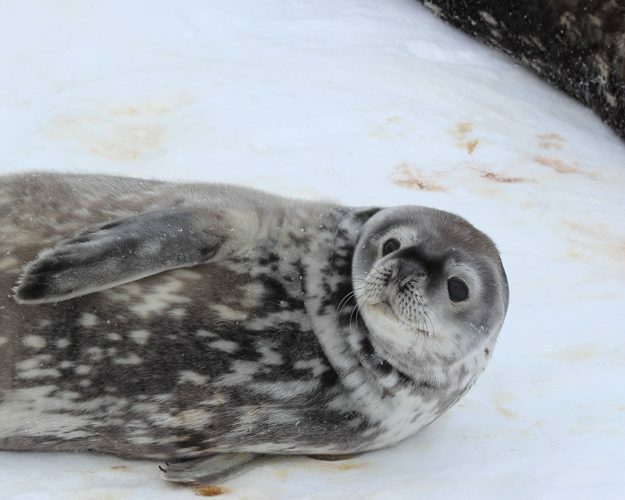 Emperor is growing up so quickly…he was the first of our seal pups to molt his fur, and he seems to have more muscle and less blubber than the other pups. He has been spending a lot of time in the water with his mom, so he is probably a great swimmer already! Gentoo is one of our gentler pups. He has recently begun taking swimming lessons with his mom, though he seemed to want to avoid getting his face wet, like most kids! 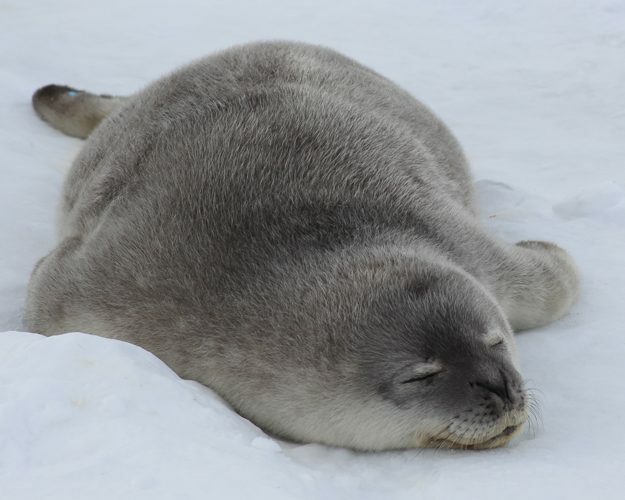 Even though Emperor is our biggest seal, Gentoo had the thickest blubber layer at three weeks old. He’ll be using some of that fat to stay warm during these early swimming lessons. King acted a little bit like a naughty prince at one week old, but now that he is older he has begun to act more like royalty. He has been away on swimming trips more often than our other animals at Turtle Rock, so we haven’t seen him as much as the others. Little Blue is our smallest pup. Little Blue may be small, but he has the most protective mom! She has started teaching him to swim, and does not stray far from his side even when she leaves to forage on her own. Of all our pups, Little Blue seems to like being near us when we are working, and has taken the time to check out the seal sled and our boots. Macaroni earned her name because she really likes nursing upside down and curled up in a curved shape next to her mom. At one week, she was a bit of a floppy noodle, but she is growing up fast. She has been on some short swimming trips with her mom, and has started to lose her baby fur around her neck and shoulders. Rockhopper earned her name because she especially likes hanging out in sea ice cracks with her mom. She has a really thick blubber layer, and may not have been swimming as much as some of our other pups. She hasn’t started working off that baby fat yet, but we expect to see her in the water soon. 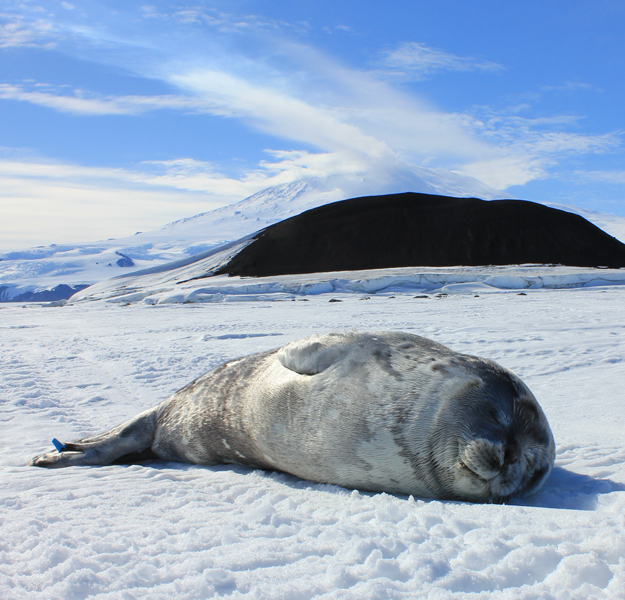 “Field work in Antarctica is way easier than we thought,” said no one, ever. We finished up a long and challenging week of sampling our three-week old pups, and we have become experts in troubleshooting on the fly in some of the most extreme conditions on Earth. We were all excited to start our week three sampling last Saturday. We piled into our Pisten Bully and headed out to our field site at Turtle Rock (about a 1.5-hour commute). It was an extremely cold day, colder than any other day we had attempted to do field work, but we were determined. When we got there, we went through all the normal motions: we found our animal, who was in a miraculously great capture spot after having been in hard-to-reach locations the whole week before, and we got our metabolic chamber out and set up. The pups were now starting to get into the water and learning how to swim, so we were interested in measuring their metabolic rates in water. To do this, we had to drill a hole in the sea ice next to our hut and use a specially-designed pump to fill our metabolic chamber with water. That effort kicked off a string of technical difficulties where our generator failed and our water pump froze and jammed. But, like any situation involving failure or misfortune, we turned this into a learning experience. To finish off our already difficult week, our last metabolic animal was in an absolutely dreadful spot for capture. Our little guy was peacefully sleeping right in the middle of a large melt pool, on the other side of a crack filled with breathing holes. To make matters worse, the pup’s mom showed up and coaxed him into the water for a little swim. We had to wait for them to return before we could begin our procedure. We call this pup’s mom “Momzilla” because she is very aggressively protective of him. After a couple hours of strategizing and waiting for Momzilla to leave her pup alone to go swimming, we enacted our plan. It was like a scene from a movie: three people carefully crossed the crack and quickly got the pup into the capture net. We rolled him onto the transport sled and strapped him down so he couldn’t roll out into the nearby breathing hole. The other two people carefully and quickly guided the sled across the treacherous terrain and we successfully captured our pup! The scariest part was that midway through, we saw Momzilla in the breathing hole, and we had to move the pup quickly before she noticed us and decided to intervene. Seal science turned Mission: Impossible! Our Week Three sampling point was tough, but we got some great data and have been able to watch our little pups go on some of their first swims. Who knows what will be in store for Week Five!